Are you feeling disenfranchised now that the recent hype wave of the Dead Air™ Nomad™ is subsiding? Do high system weights and à la carte part pricing have you down? Fear not. You don't need to spend lumps more money to outfit your suppressor. We've got your back. 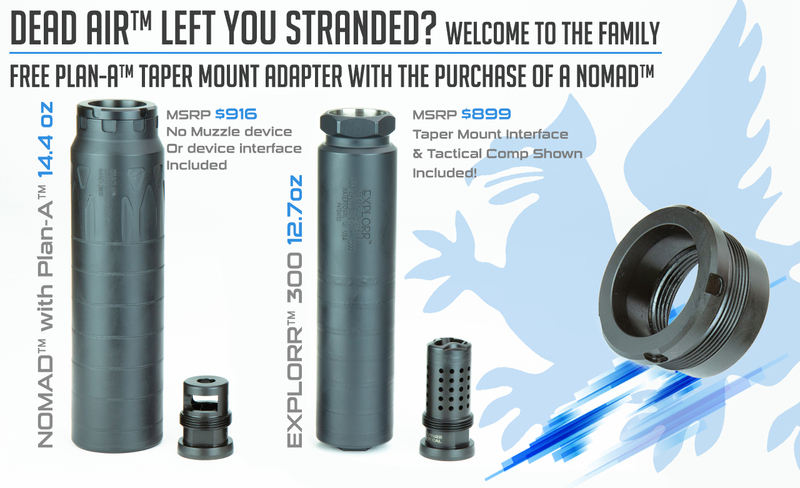 From now until December 31st 2019, any Dead Air™ Nomad™ Silencer you purchase will be eligible for a free PLAN-A™ taper mount adapter! That's right. We love silencer owners and we don't believe they should be left in the cold. The Griffin customer family has more room and now's the best time to jump on board! This adapter adds almost no length to your Nomad and is only compatible with the Griffin Minimalist muzzle brakes and direct thread adapters. Total system weight of NOMAD™ equipped with PLAN-A™ taper mount adapter is 14.4 ounces. 1 ) Simply purchase a new Dead Air™ Nomad™ silencer anywhere in the US, then email your proof of purchase (receipt) and a copy of your Form 4 to tech@griffinarmament.com Do not purchase shipping and handling until you have been contacted by customer service. 2 )Then CLICK HERE TO PURCHASE SHIPPING AND HANDLING Please comment your suppressor serial number in the checkout comments of your shipping and handling order so it can be cross referenced with your email documents. Failure to comment in your serial number will result in your adapter not shipping. Adapter will be shipped to the shipping address on this checkout order, not your Form 4 address.